You can't mention щи without mentioning the saying «Щи да каша — пища наша» “Cabbage soup and boiled grain is our kind of food.” People say this when they are putting ordinary food on the table to indicate that they aren't fancy-shmancy gourmands with expensive tastes. They are just good ol’ down home folks with simple desires. The American equivalent would be something like “We’re meat and potatoes folks.” Here are some sample sentences. — Из чего делают щи? Фу, в моих щах плавает муха! Yuck, there is a fly floating in my cabbage soup! — Я люблю щи заправлять майонезом. К щам лучше подавать чёрный хлеб, а не белый. It's better to serve black bread with cabbage soup, not white [bread]. 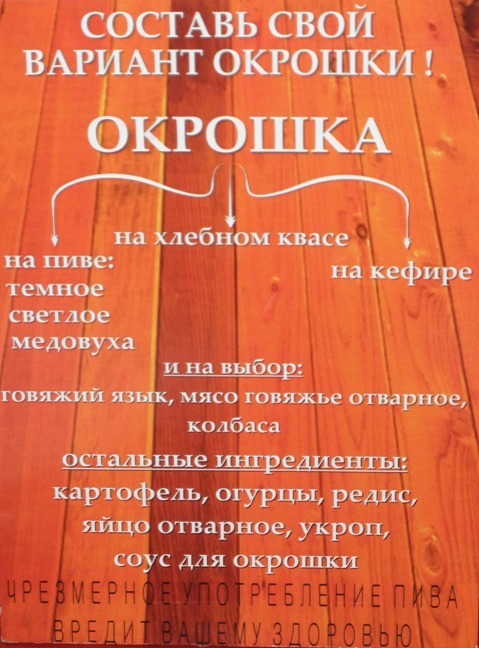 It says that they will make окрошка special for you not just with kvas, not just with kefir, but, if you prefer, with BEER! That's right, окрошка на пиве! You can have it made with dark beer, light beer, or honey beer! Beer soup for lunch... does that not sound like redneck heaven??? Plus they will be happy to add beef tongue, boiled beef, or sausage. See if you can figure out what the остальные ингредиенты "remaining ingredients" are from the sign. Окрошка на светлом пиве мне не очень понравилась. I didn't care for the okroshka made with light beer. Мама всегда готовит окрошку на кефире. Mom always makes kefir-based okroshka. Я считаю, что редиска в окрошке не нужна. I think you can do without the radishes in okroshka. Бабушка всегда угощала внуков окрошкой. Grandmother always treated the grandkids to okroshka. The Russians love soup, and frankly the best soups I've ever had in my life have been in Russia. That's because the Russians aren't worried about things like heart disease and cardiac plaques: there's plenty of fat or butter in every soup. And soup is an essential part of обед. If you try to serve a Russian обед and there's no soup involved, you can be darn sure they think you are stinting on your hospitality. 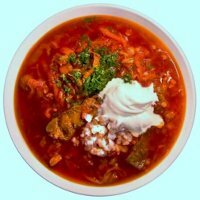 The most famous Russian soups are a beet soup called борщ (see Olga's entry about it) and a cabbage soup called щи. Although for classroom purposes we say that Russian has six cases, in fact it has quite a few more. Some nouns distinguish a locative case that is separate from the prepositional case, and суп is one of them. That is, sometimes instead of «в супе» you may encounter «в супу» with the meaning “in the soup.” The locative case is slowly dying out in Russian, merging with the prepositional. «В супе» is much more common these days than «в супу». You may also encounter a partitive case form супу, which means “some soup” as in «Хочешь супу?» “Do you want some soup?” or «На завтра хозяин сварил грибного супу из шампиньонов» “For tomorrow the host has made some mushroom soup from champignons.” The partitive case is also dying in Russian, merging with the genitive case. Mostly you will find the plain genitive case in such contexts nowadays. Мама делает суп из сушёных грибов. Mom makes soup from dried mushrooms. Девушки, подскажите, как варить мясо для супа? Ladies, could you please tell me how to boil meat for soup? Алёна Винницкая покорила мужа гречневым супом. (source) Alyona Vinnitskaya won her husband over with buckwheat soup. 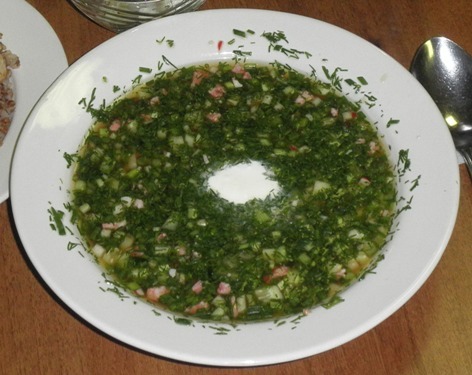 One of the most traditional Russian dishes is борщ. This is a soup primarily made from beets, potatoes, cabbage, meat, and carrots. This dish is commonly served with a dollop of sour cream and rye bread. This soup dates back to the 18th century and is commonly served in Russia, Ukraine, and Poland. Growing up, I can distinctly remember having борщ for dinner a few times a week. As a child, I remember helping my mother in the kitchen as she made this delicious soup. Today I make this soup for my family; it continues to be part of our family tradition. I have noticed that in almost every Russian household in America, борщ continues to be a traditional soup and is made regularly by many of my Russian friends. I feel very happy when I visit my Russian friends and they offer me борщ. They say, «Ты хочешь борщ со сметаной? » “Do you want some borscht with sour cream?” I love it that a simple soup can bring family and friends together and help them stay connected and close.